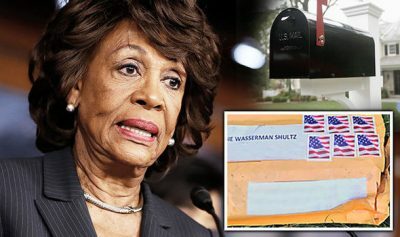 The Latest Mail Bomb Scare. An Orchestration? I appreciate readers’ confidence that I can explain the mail bomb scare that has been blamed on Cesar Sayoc. I have not followed this story and regret that I don’t have an explanation to provide. Stephen Lendman raises the question whether Sayoc is a real culprit or a patsy for an operation orchestrated for political reasons. While driving I listened to a large part of the press conference, and the affair struck me as an orchestration. Every agency involved was present, from the Postal Service to the FBI and Secret Service, the directors of which praised the expert professional performance of their agencies in intercepting the bombs. It seemed to me overdone, especially in view of the FBI’s admission that they could not say that the bombs were functional. Why would a bomber send non-functional bombs? There are other things to notice and to wonder about. Photos of the packages, if these are the actual mailed packages and not someone’s construction used to cast doubt on the official story, do not show postage sufficient to cover the weight of a bomb. Also, all the anti-Democrat stickers on Sayoc’s van seem very new and unfaded to have spent much time in the Florida sun. Whether one likes Trump or not, it is clear that the establishment wants rid of him. He was elected by the “deplorables,” that part of the population that has been left behind by the elite who manage things in their interest alone. The elite are scared that such an electoral outcome could happen again. A defeat of Trump is a defeat of the populist forces that put him in office. There is no doubt that Americans have been fed a constant stream of lies to justify political agendas, for example, Serbia, Saddam Hussein’s weapons of mass destruction, iranian nukes, Libya, Russian invasion of Ukraine, and there are so many unanswered questions about mass shootings such as the one in Las Vegas that suspicion of official stories are on the rise. How does one justify believing a government that will lie in order to justify aggression abroad and police state measures at home? It is entirely possible that Sayoc is an incompetent culprit and that suspicion of the official story is a consequence of the government playing fast and loose with the truth in the past. It is also a legitimate question whether the US government, by which I do not mean simply the Trump administration, is worthy of the trust of the American people. Democracy doesn’t work without public confidence in government. The sacrifice of public confidence to political agendas destroys the basis of political life.